Here it is! 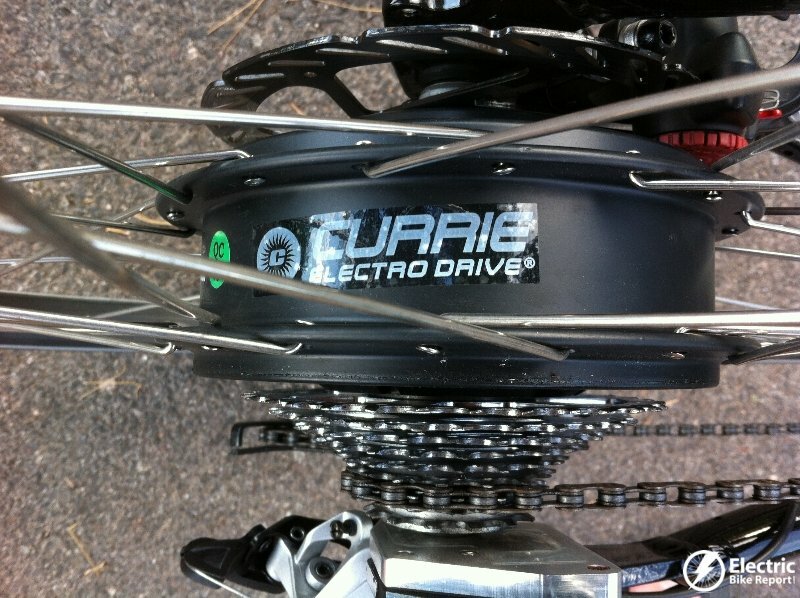 The full review of the Currie Technologies IZIP Ultra electric bike with a tough range test for this road style e-bike. If you are looking for a sporty and nimble road style electric bike, the IZIP Ultra should definitely be on your list of bikes to consider. Make sure you check out the video, large pictures and specifications of the IZIP Ultra. The IZIP Ultra bike has skinny tires like a road bike and it has that quick and nimble feel of a road bike. It is quick but you also need to be quick to respond because narrow tires are not as forgiving as wider tires. The IZIP Ultra reminds me of the Emotion Max 700 electric bike that I reviewed earlier this year. The Max 700 also has the road bike style with the flat handlebars. These are generally referred to as hybrid bikes; a hybrid between road and mountain bike styles. This bike is mainly meant for getting you around town or on your favorite road loop with a quick and efficient feel. Even though the bike is meant for the road I enjoyed taking it on some gravel and rock paths. 🙂 It handles pretty well but you need to be very alert to every obstacle. Note: if you plan on riding on gravel paths, you will want to change the tires to something that is more off road worthy. Electric spec wise, this bike comes with a 500 watt geared rear hub motor and a 36 volt 10 amp hour lithium ion battery pack. Combining a 500 watt motor with the skinny road bike style tires makes for a sporty feeling ride! One of the unique features of this bike is that the battery is housed in the downtube of the frame. This keeps the weight of the battery low and centered on the bike. The IZIP Metro also has this feature. The Ultra has the pedal assist (PAS) and/or throttle (TAG) options. The pedal assist has low, medium, and high settings and you can also grab the throttle for a little extra assist. In the pedal assist mode the bike provides power based on how much power you are putting into the pedals. 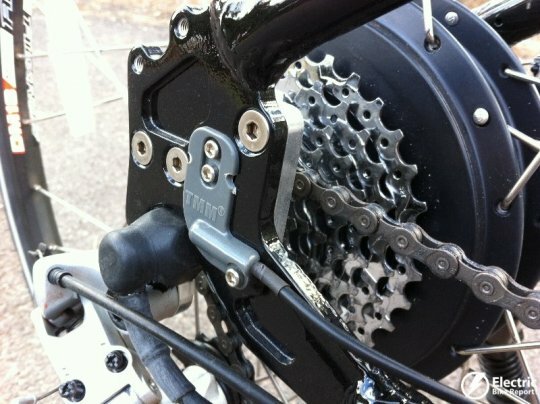 There is a TMM4 torque sensor that is attached to the right rear dropout of the bike and it sends information to the controller of the bike. The throttle option is simply a throttle; you can decide if you want to pedal or not. Here is the range and elevation info using the highest pedal assist setting. Range: As you can see from the GPS info that I recorded, the bike traveled 26.4 miles and did a total elevation gain/loss of around 2200 ft. Considering that I weight 190 lbs and I pedaled very lightly this is very good range for a 36 Volt 10 ah battery pack (360 Watt Hours)! This big range is probably due to the fact that the IZIP Ultra has the skinny road bike tires, which are much more efficient when compared to wider mountain bike style tires found on a lot of e-bikes. Speed: The IZIP Ultra gets up to 20 mph pretty darn quick, thanks to it’s 500 watt geared hub motor. It also climbs hills pretty well. On the really steep hills you will need to give the motor a little help but for moderate hills you can pedal lightly or just turn the throttle and sit back as the bike takes you up the hills. Weight: This bike tips the scales at 50 lbs. The weight distribution on this bike is pretty good because the battery is centered in the middle of the bike and low to the ground. The motor on the back makes it a tad bit back heavy but it is only noticeable when you pick up the bike. The Range! 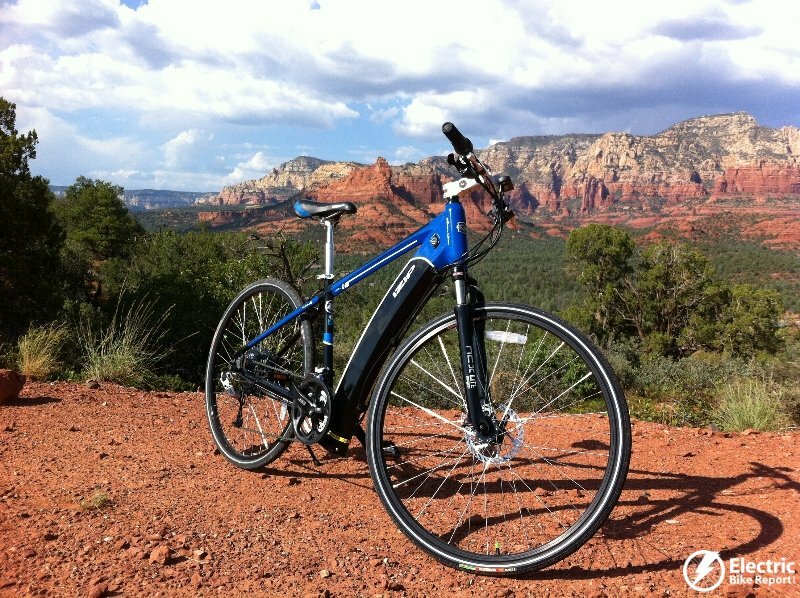 26.5 miles and 2200+ feet of climbing is impressive range for a 500 watt e-bike with a 36 volt 10 ah battery system. The narrow road bike tires definitelty helped out with making this bike more efficient. The TMM4 torque sensor may also help by efficiently metering out how much assist (power) to provide at the appropriate times based on the level of rider input. Battery in the down tube: The battery is one of the heaviest components of an electric bike and positioning this weight low and near the center of the bike is good for the overall handling. The Ultra has a unique down tube design that also protects the battery in case of a fall. Powerful! 500 watt motors are pretty powerful and when combined with the skinny tires, it makes for a quick feeling e-bike. When using the pedal assist the bike really makes you feel like a super strong road cyclist! Disc brakes: I am a fan of disc brakes for fast electric bikes because traveling at 20 mph consistently requires good stopping power. The IZIP Ultra comes with AVID BB5 mechanical disc brakes front and rear. I have used AVID disc brakes on my mountain bike before and they are simple, yet powerful and reliable. Nice tires: The Vittoria Randonneur 700 x 35c tires are a well known brand name tire and the wider size is good for overall stability that still maintains an efficient ride. The Ultra also comes with Slime self sealing inner tubes that help prevent flats from glass, thorns, tacks, etc. Drivetrain: The SRAM drivetrain and shifters are good quality bicycle components that should last for many years of riding. SRAM is a well know component manufacturer in the conventional bicycle world. Suspension: The Ultra is meant for getting around on the road quickly and that usually means a rough ride. Currie Technologies added a suspension fork and suspension seat post that really takes the edge off of cracks and bumps in the road. The Ultra felt way more comfortable than most conventional road bikes. Battery hard to remove: Removing the battery from the down tube is not so easy. It require that you unbolt the cap on the bottom of the frame. Easy removal of the battery is handy if you want to take the battery with you to charge in your house or at the office. If you charge your bike in the garage then this won’t be an issue. Torque sensor: The TMM4 pedelec torque sensor was not as smooth as other bikes I have ridden. It had a little more of an on/off feeling compared to easing in and out of the pedal assist like some other e-bike systems. Motor noise: Most geared hub motors have a noise from the gears in the motor. The noise is more noticeable when you are accelerating or going up a hill. It is quieter when you are up to speed and cruising along. Overall I really enjoyed getting around town on this nimble and efficient electric road style bike. It had that quick feel of a road bike with enough cushion (suspension) to take the edge off of the road. I was impressed with the 26.4 mile range and the weight distribution of the Ultra as well. The IZIP Ultra retails for $2,899. Where to get the IZIP Ultra? Check with the Currie Technologies for a dealer near you. Do you have any questions about the IZIP Ultra? Do you own the Ultra? Please share your thoughts in the comment section below. Hey, I have an Izip Ultra and I found that your review mentions all the the pros and cons I would have mentioned. I was especially wondering a little about the motor noise on my bike. I thought there might be something wrong with the bike. But I guess it’s normal for this bike since you noticed it too. It’s kind of irritating. My torque sensor is also a little jerky, causing the motor to generally be either on or off, but I can smooth it out a little using the throttle. I have two other ebikes, a Pedago Cruiser and an ebike I made from a kit I bought from Electric Rider of San Angelo, TX. 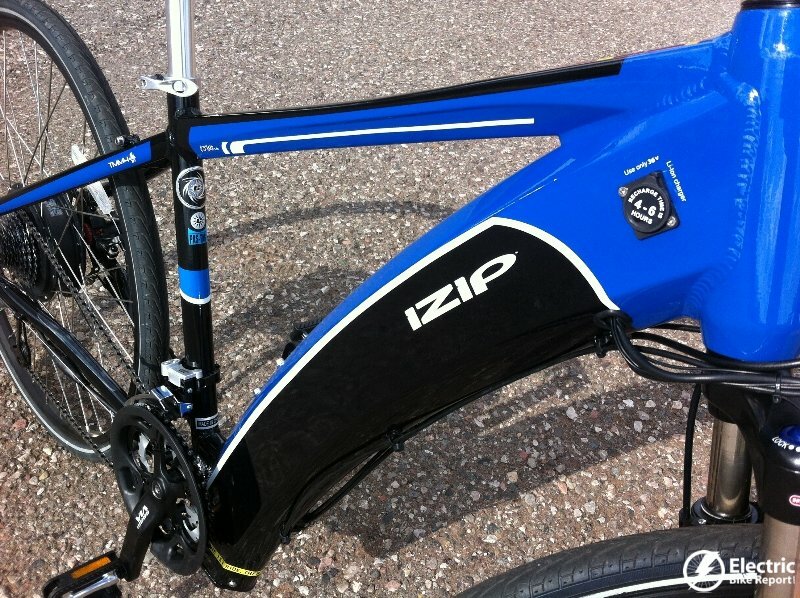 The Izip is my favorite ebike of the three. Hi Jon, Thanks for your thoughts on the Ultra. How many miles do you have on yours? I don’t know, probably over 1,000 miles by now. I usually go out for a ride until the “tank” is half full and then head back. I’ve never run out of juice yet. Although I’ve been close a few times. A normal ride is maybe 25-30 miles. Pete, you mentioned the less-than-smooth TMM4 torque sensor. What ebikes have the better torque sensor with which you contrast the TMM4? 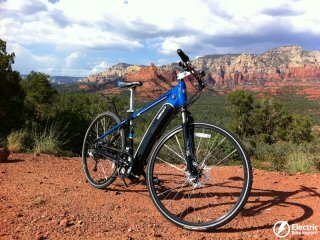 Hi Smith, I have ridden other e-bikes with the TMM4 that felt smoother. It may have to do with the programming of the Ultra.